John is blessed with several Aunts and an Uncle, all who are married and have families. One of his favorite is his Zia (Aunt) Italia. He grew up with her right next door. We were told that she had been diagnosed with an aggressive cancer and given a short time to live. I don't speak Italian or their dialect fluently but I couldn't not send her a card. With our Paper Doily Sizzlits L die (they have reworked it and it works better!) I punched out a doily in Crumb cake. Our Large adhesive Pearl is a perfect fit for the center. 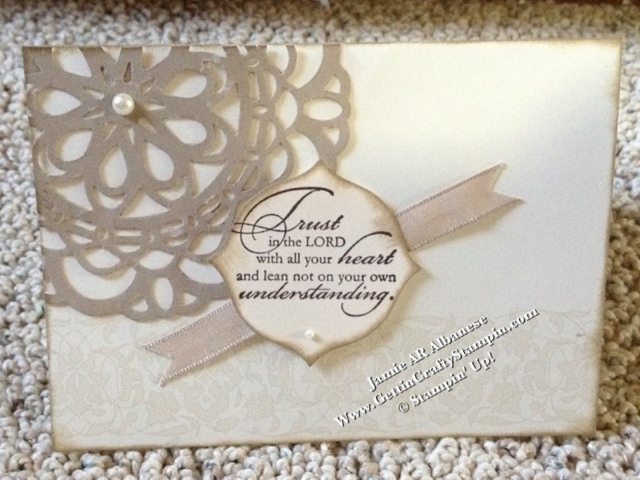 We sell cards that are precut, scored and here stamped with a lace on Very Vanilla in Crumb Cake. It's called English Ivy Implement Sentiments (pg 158 of the Idea Book). I used our crochet and our Taffeta ribbon to see which one John would like. We went with the Taffeta in Crumb cake. 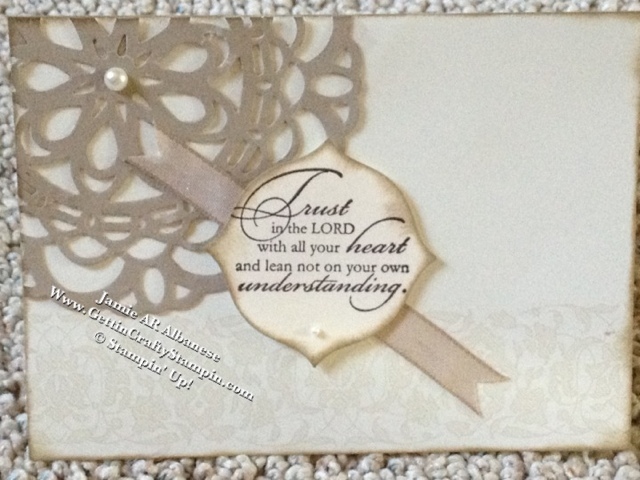 With our Apothecary accents Framelets I punched out this Trust in the Lord (stamped with Chocolate Chip in) stamp set from Trust God on page 136. 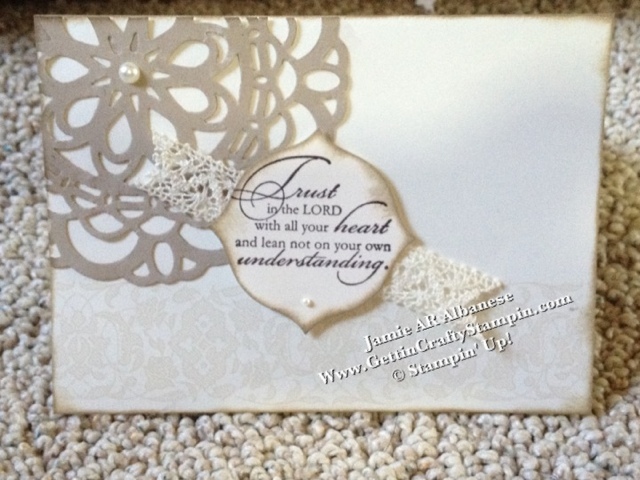 I daubed the edges in Crumb Cake and adhered with Stampin' Dimensional adhesive. We know that Zia Italia's time is limited and I'm beyond sad over this. She is a warm and loving woman who adores the babies (she just had her great granddaughter born and is loving time with her). With John's family this willl be a huge loss. 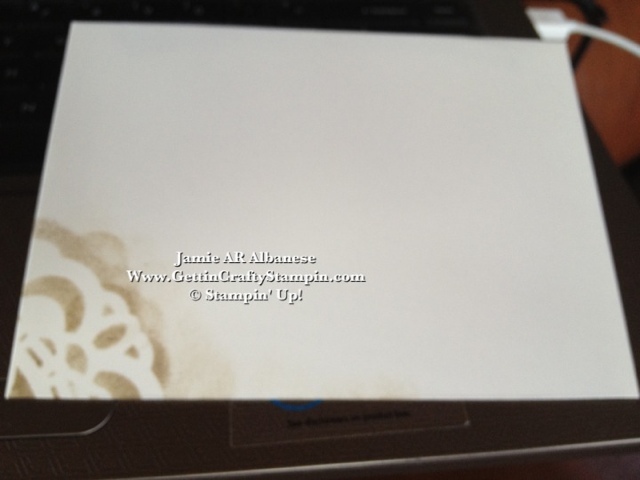 I hope that this card sends her a little love. 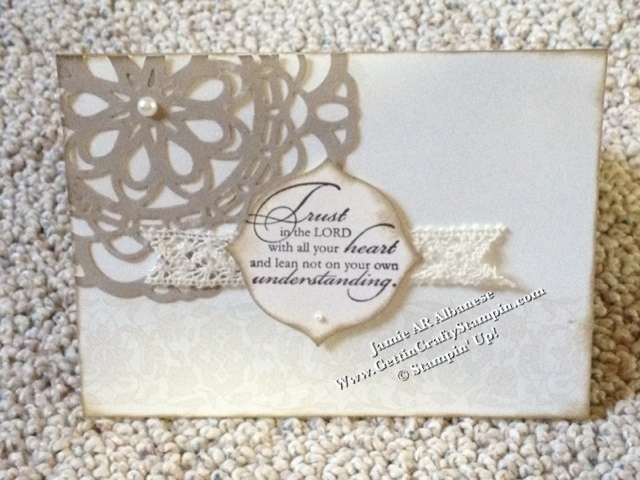 I did wrap up the card by daubing in on the corner thru the doily. 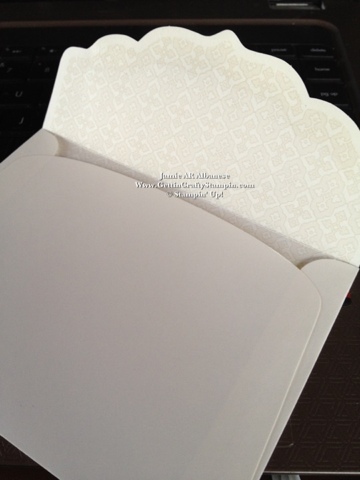 The envelopes have the lace on the inside even. She isn't doing well right now and as I send my prayers up for her and my love to her... I hope this card made her feel a little of our love.